It’s been said that three’s a trend, but when two fashion powerhouses such as Kendall Jenner and Rihanna both turn up carrying the same throwback accessory, that’s certainly something in the air. Jenner was one of the first to bring on the return of the fanny pack, stepping out in iterations by Prada, Chanel, and Louis Vuitton, too. Though now it seems Rihanna is following in the model’s footsteps with a Christian Dior version of her own. The singer was photographed in Paris on Friday night while wearing her fanny pack slung over one shoulder with so-bad-it’s-good aplomb. But her bag wasn’t the only major hit in the mix. 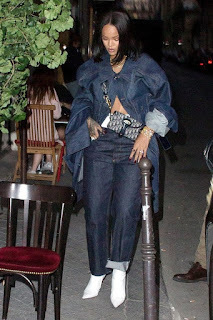 Rihanna doubled down on the denim tuxedo with a pair of boxer shorts peeking out of the top of her waistband, giving a distinct ’90s attitude. She left the jacket unbuttoned for the most part, revealing a flash of bare midriff for good measure. The oversize ensemble was a nice contrast to her compact handbag and coordinated with her tangle of gold necklaces and bracelets. Pointed white-toe boots punctuated the moment, elevating off-duty denim with ease.